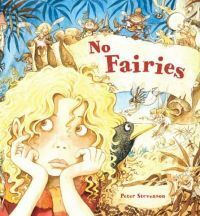 An enchanting story about a little girl who lives in the midst of fairies and other wonderous creatures but can't see them. She goes on a quest to lok for them and, after many adventures, finds them. The book is packed with dramatic and compelling scenes and the author/illustrator, Peter Stevenson, has drawn a wealth of intriguing details on every page. Peter has illustrated scores of attractive books for English publishers. He lived on the Llŷn peninsula for a while during his childhood. he has lived in Aberystwyth for more than 25 years.